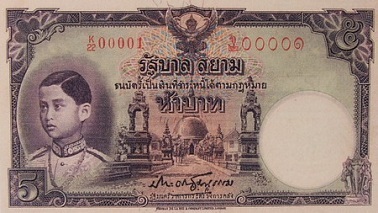 The 5 Baht banknotes have 2 types that were printed from Thomas dela Rue. Thomas type 1 ordinary number signature Pradid EF about 15,500 - 16,000 baht. Thomas type 1 ordinary number signature Pradid VF about 12,000 - 12,400 baht. Thomas type 2 ordinary number signature Pradid UNC about 171,000 - 180,000 baht. Thomas type 2 ordinary number signature Pradid F about 35,500 - 37,200 baht. The World War 2 emerged in Europe in 1941 but not affected to Thai local way of life in early stage. Until Japanese troops launched violent attack on Perl Harbor in Pacific on December 7th, 1941 and invaded Thailand through the eastern seaboard in southern Thailand on the next day. Thai government had to comply the Japanese troops to enter into neighbor countries and was forced to declare the war against the Allies. And Thai government could not order the new notes from Thomas de la Rue, the opposite country base company. 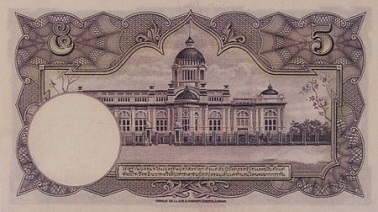 The 4th series 5 Baht Thomas type 1 banknotes were announced on 14th April 1939. 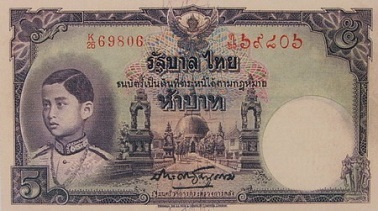 The 4th series 5 Baht Thomas type 2 banknotes were announced on 7th Marchr 1939.